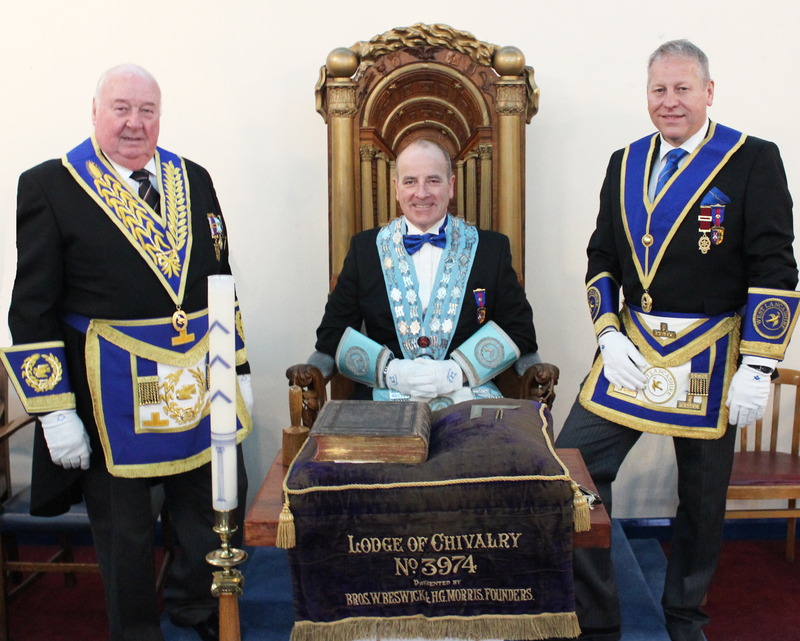 The members and visitors to the Lodge of Chivalry No 3974 installation meeting were treated to a short but very enjoyable ceremony conducted by the lodge director of ceremonies, David Dugdale. David is the IT Director for Crown Paints who are based in Darwen, Lancashire. David has worked for Crown Paints for 11 years and although the head office is in Darwen, David regularly travels around the world to attend management meetings held by David’s boss who is a vice president of Hempel, a global supplier of marine paints and coatings. David and his wife Gaynor have two children Natasha and Alex. Although David has a busy work and family life he still finds time to enjoy his Freemasonry and has been known to drive straight from Manchester airport having arrived from a trip to America or other parts of the world to Ormskirk to attend a lodge rehearsal! David proclaimed Andrew Bradshaw for a second term as WM. Andrew Lives in Newquay, Cornwall and travels to Ormskirk every month to attend lodge and visit his mother and father who live in Rainford, Nr St Helens. Andrew served in the RAF for 24 years and for the last 11 years has worked for Serco who provide support for the military, as a senior supervisor at Royal Navy Air Station, Culdrose, Helston. After Andrew was proclaimed as WM he was presented with the working tools of a master Mason by Martyn Fenton, the working tools in the second degree where presented by Martin Stewart who will be installed as WM next year when the lodge celebrates its centenary. The working tools in the first degree where presented by Adam Woods who has only been a Mason for 11 months. Pictured from left to right are: Peter Levick, Andrew Bradshaw and David Dugdale. After investing his officers for the ensuing year, the address to the wardens was given by Colin Frodsham and the address to the brethren was given by David. After the meeting the brethren retired to the dining room to enjoy a fine meal and some liquid refreshments. At the festive board Peter thanked Andrew for staying in the chair of the lodge for another year. He also thanked David on the work he did in the lodge and all the brethren who took part in the ceremony particularly the junior members who presented the working tools. 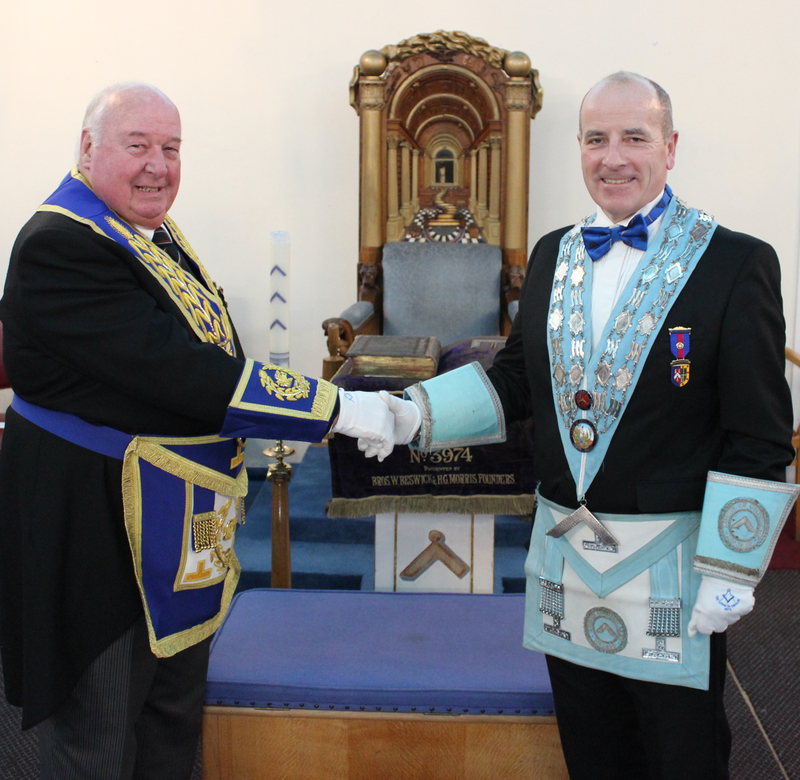 Later in the evening the lodge secretary and senior Provincial grand officer, Mark Holloway presented Andrew with a leather bound-copy of the summonses in the Ormskirk and Bootle Group that had taken place during Andrew’s first year in office. Pictured from left to right are: Rick Walker, Graham Chambers, Peter Levick, Andrew Bradshaw, David Dugdale and Malcolm Alexander.